Dr. William P. Blair is an Astrophysicist and Research Professor in the Department of Physics and Astronomy at The Johns Hopkins University. He currently splits time between ongoing research projects at Johns Hopkins and as a planning system liaison scientist at the Space Telescope Science Institute, working on development activities for the James Webb Space Telescope project. Prior to FUSE, Bill worked for many years on another telescope project headquartered at Johns Hopkins. This telescope, called the Hopkins Ultraviolet Telescope, flew twice on the space shuttle (in 1990 and 1995). Bill is also a user of various instruments on the Hubble Space Telescope, The Chandra X-ray Observatory, and other space-based and ground-based facilities. Includes Solar System Size and Scale examples, "How much is a Billion? ", the Toilet Paper Timeline example, and more. Bill has become very engaged in the Global Warming/Climate Change Discussion over the last several years. He has received so many requests for his presentation that he has posted it on the web for general access. If you find the information useful, please use it! (But please provide proper attribution as you would with any materials obtained from the web). PDF and PPT version are available HERE. More will be added as time permits. JHU Alumni Solar Eclipse Trip, August 2017 In August 2017, Bill was privileged to host a group of JHU alumni and friends at the Moose Head Ranch in Moose, Wyoming, to view the Great American Solar Eclipse! The trip was a spectacular success, with perfect viewing conditions at a unique and beautiful setting in the Teton National Park. Some photos from the proceedings are available in this photo album. In May 2013, Bill was pleased to be named a Distinguished Alumnus of his high school in Michigan, Bill was honored at a reception on Fri. May 31, 2013, and spoke at the JGHS graduation on June 1, 2013. Photos of the events are available HERE, and a PDF of Bill's remarks to the graduates is HERE. Bill was also made "Distinguished" by his alma mater, Olivet College, in 1998. Iceland May 2-12, 2014. Bill was lucky to be able to travel to Reykjavik and Iceland for 10 days with a group of students and alumni from his undergraduate school, Olivet College in Michigan. Mountain views, waterfalls, glacier hiking, and whale watching were but a few of the highlights of this great trip! Telescopic Observing Run to the MMT Observatory on Mt. Hopkins, AZ, Sept. 11-14, 2007. These photos document the beautiful scenery of southern Arizona from the vantage point of 8800 ft. Mt. Hopkins, south of Tucson, home of the MMT Observatory with its 6.5 meter telescope. Some beautiful cloud formations and spectacular sunsets nevertheless gave way to some good observing with this wonderful facility, run by the Smithsonian Astrophysical Observatory and the University of Arizona. Telescopic Observing Run at the WIYN Telescope on Kitt Peak, Arizona, Aug-Sept. 2008. More clouds, sunsets, and telescope domes. (We could have done with a few less clouds and more "boring" sunsets, but that's the way it goes!) Contains some beautiful vistas of the southwestern Arizona desert, about as green as you will ever see it! Other observing trips are viewable from the Photo section of my Facebook page (linked above). July 2015 Hubble Space Telescope 25th Anniversary photo release on the Veil Nebula in Cygnus. 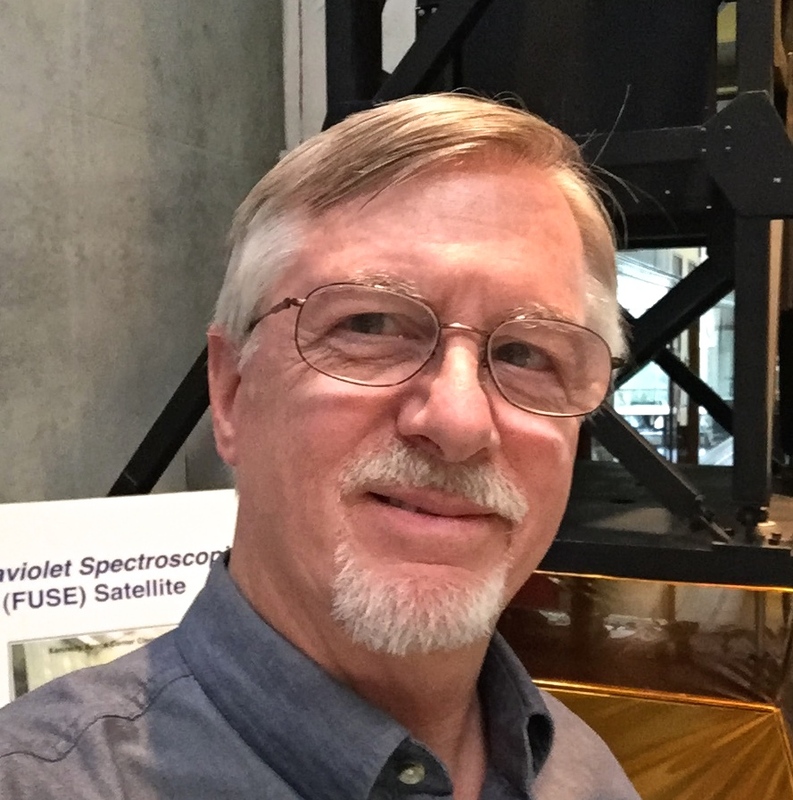 Bill helped plan one of the 25th anniversary photo releases for the Hubble Space Telescope by providing expected flux information for the gaseous filaments in the Cygnus Loop supernova remnant, also known as the Veil Nebula. the resulting image was nothing short of spectacular. Bill also provided a description of the image to provide context for those wanting to know more about the image. January 2014 Hubble Heritage Release of M83. Data from Bill's cycle 19 Hubble proposal was used to make this impressive mosaic image covering the central regions of the face-on spiral galaxy M83 (a.k.a. NGC 5236). Data from six WFC3 camera fields and 42 orbits of Hubble data went into making this one spectacular image. July 2008 Hubble Heritage photo release on the remnant of SN1006, a 1000-year old supernova in our Galaxy. This Hubble image, made with the Advanced Camera for Surveys and the WFPC2 instrument, shows a delicate ribbon of gas excited by the passage of the supernova remnant blast wave as it expands outward at nearly 3000 km/s! Also see the Hubble News site release on this result. October 2004 Press Release support page on the 400th anniversary of the sighting of Kepler's supernova in 1604. This page provides background information, links to the press release images, and a link to the Hubble Heritage Project photo release of the Hubble Space Telescope data. June 2004 Press Release on the FUSE observation of a Star Behind the Cygnus Loop. This link points to a support page for the press release, including images. But links are provided for the press release itself, as well as the FUSE Science Summary page for this result. June 2003 Hubble Heritage Image of the Pencil Nebula. Follow this link to a cosmic painting of the Pencil Nebula, part of the much larger Vela supernova remnant, created by the Hubble Heritage Project folks at the Space Telescope Science Institute. (Bill collaborated on this release.) I provide some further information about the Vela supernova remnant HERE! June 2000 Hubble Heritage Image of the Crab Nebula. Follow this link to a magnificent image of the Crab Nebula supernova remnant, created by the Hubble Heritage Project folks at the Space Telescope Science Institute, using data supplied by Bill and his collaborators. (Further information and pictures from a different perspective (mine!) are available HERE! Hubble Space Telescope image of the Cygnus Loop supernova remnant. This link connects to see some wonderful images of the Cygnus Loop supernova remnant, obtained with the Hubble Space Telescope, and presented at the American Astronomical Society meeting in Austin, TX, in January 1999. It was published in the Astronomical Journal and was later released by the European Space Agency HST site as a special photo release in October 2000. 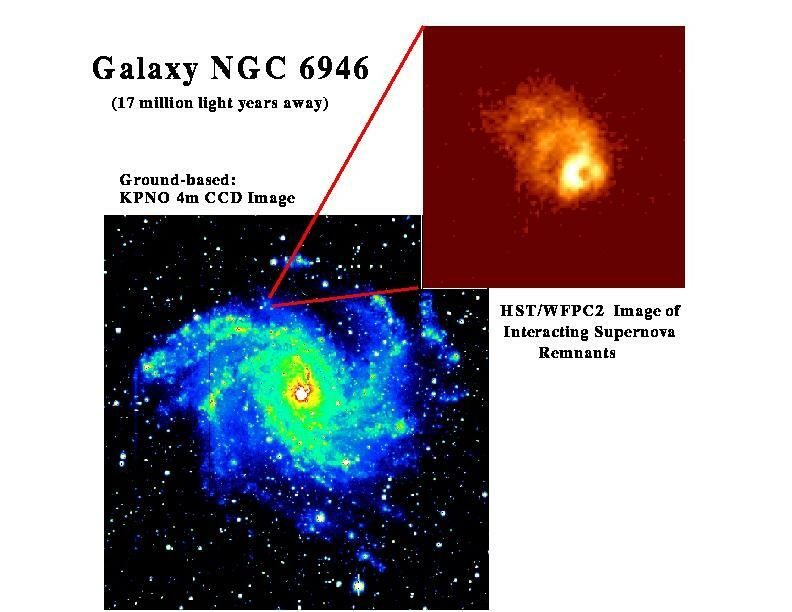 Colliding Supernova Remnants in NGC 6946 This link connects to a JHU Press release on one of Bill's research results from June 1997. Click here to get a better (JPEG) version of the press release figure. Abell 30 Planetary Nebula This links to some nice multi-wavelength color images of the planetary nebula Abell 30, obtained with the 4-meter Mayall telescope at Kitt Peak National Observatory in Arizona. Seeing God's hand in galaxy's design by Bob Allen. This links to an online version of a Towson Times newspaper article, dated 8/11/2004. An Astronomer Shifts His Gaze from the Stars to the Earth by Alisha Horowitz. This links to a PDF version of an article from the Spring 2011 issue of Shipherd's Record, the Alumni magazine of Olivet College, Olivet Michigan. Thanks to Alisha for a very nice article! You can also view pictures of the FUSE 10th anniversary party my Gallery page.